Membership at Cherokee is a family membership, which entitles the member's spouse and dependent children (who are not in the work force) to full use the Club's facilities under the rules & regulations set forth by the Board of Directors. 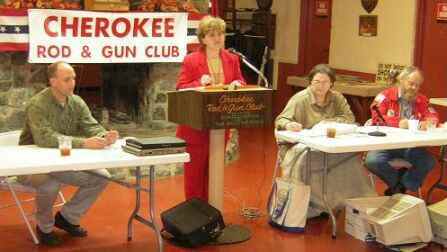 For more information refer to the Club's By-Laws or the Basic Firearms & Range Safety for Members & Guests. A copy of Club rules will be provided upon membership acceptance. Club meetings are held on the first Thursday of every month starting at 7:00 PM (except major holidays, in which case the meeting will be held on the following Thursday). After the meeting is called to order dinner will be served for those who wish to partake. After dinner, Club business and announcement take place. For more information on what is required to become a member please refer to the 2019 New Member Application Form below. The application form can be downloaded and filled out in its entirety and mailed to the Club's post office box or brought to the Club office during regular business hours, which are the 1st Thursday of each month (meeting night), 1:00 to 6:00 PM. New members may join for 2019 any time after December 1st of 2018. We do not prorate dues, the cost is the same no matter when you join. The expiration date for 2018 membership is February 28th of 2019. If you do not renew your membership within 12 months of the expiration date, you will have to submit a New Member application for approval and complete the Safety Walk-through over again. For new members, upon receipt of your completed application and the correct dues amount, you will be presented for approval at our next regular Club meeting. You do not have to be present to be approved. NOTE: YOU WILL ONLY BE CONTACTED IF YOUR APPLICATION IS NOT APPROVED. You may call 423-357-5470 after meeting night to check on the status of your membership. All new members must attend a regularly scheduled Club Safety Course and Walk-through of Club facilities before you may receive a membership card and gate key. The required Safety Course & Walk-through begins at 2:00 PM sharp (sign-in at 1:45 PM) on the 2nd & 4th Sundays of January, February & March and 2:00 PM sharp (sign-in at 1:45 PM) on the 2nd Sunday only of April through November. There are no walk-through's held on major holidays or holiday weekends unless otherwise noted on the Club calendar. Regular office hours are the 1st Thursday of each month (meeting night), 1:00 to 6:00 PM. You may not take the Walk-through until after you are accepted for Membership. Renewing members can download the 2019 membership Renewal Form below. All renewing members must complete a new application each year. For more information or questions regarding membership please contact the Membership chairperson Ramona Fletcher (see links below). Due to the new membership software, each person that is renewing should fill out an application to help the committee enter the proper data into the computer. The applications are available at the office or you may download the application by clicking on New or Renewal Applicaton listed above. Membership fees must accompany all applications. You may bring your application to the office during office hours, to the monthly meetings or mail it to the club address on the application. All new memberships must be voted on by the membership in attendance at a monthly meeting before acceptance. After a membership is accepted, a safety walk-through is mandatory before your membership card/gate-key will be issued. If you would like to join and have questions, or if you have membership problems please contact Ami or Ramona Fletcher at rgfletcher@chartertn.net or 423-357-5470 and leave a message with your questions and phone number and she'll return your call.